“This is good news. It actually means that owners of electric cars like the one I have can drive over longer distances as normal cars, not only for commuting like today,” says Leif Petter Nergård. Nergård lives in the Pasvik valley in Norway’s northeastern corner and commutes with his Nissan Leaf to Kirkenes. From Kirkenes, European Highways head towards both Russia (E105) and further south in Norway (E6), as well as a cross-border road into Finnish Lapland. This week, Enova – Norway’s public agency supporting renewable energy and efficient consumption, said a tender on building fast-chargers along all major roads in northern Norway will be announced this year. First round is now in January, next comes in September. Enova’s requirement is a minimum of two chargers per 50 kilometers along the main road network. When in place, it will be possible to drive your electric car all the way from the Arctic Circle at Saltfjellet to Lofoten Island in the west, North Cape in the north and Kirkenes with the border to Russia in the east. 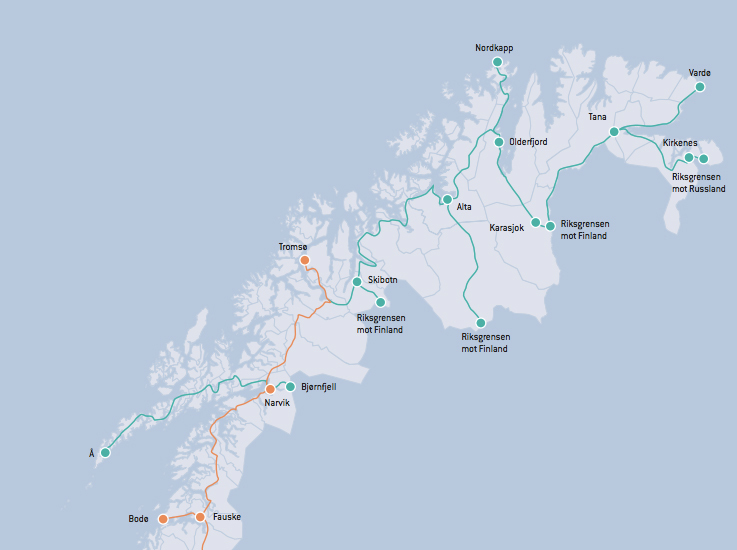 The cross-border roads on the list are Narvik-Bjørnfjell, Skibotn-Riksgrensen, Kautokeino-Enotekiö, Karasjok-Karigisniemi and Kirkenes-Storskog. “We believe this network of fast-chargers will make the electric car more attractive. That will lead to increased demand for and profitability for new fast-chargers other places,” says Nils Kristian Nakstad, Director of Enova. “When you can drive your electric car also on longer tours, you don’t need the fossil fueled car any more,” Nakstad argues. Finn Helge Lunde, owner of a Tesla Model S, lives in Kirkenes and welcomes the new fast-chargers in the high north. “It is very positive that Enova takes such initiative and expands the network of chargers all over Norway and not only in densely populated regions. There are more and more electric- and plug-in hybrid cars available and my experience after driving electric car for two years in Finnmark is good,” Finn Helge Lunde tells. Lunde says a well-developed network of fast-chargers is as important for drivers of electric cars as gasoline stations are for drivers of normal fossil fuel cars. Sales of electric cars in Norway has boosted the last few years after the government decided to exempt zero emission cars from sales tax and registration fees. Many places, drivers of electrical vehicles also get free parking, free ferries and free road-tolls. All new chargers in northern Norway will be in place before the end of 2017, according to Enova. Electric cars accounted for nearly 30 percent of all new cars sold in Norway in 2015. Among the most popular are Tesla Model S, Nissan Leaf, VW e-Golf and BMW i3. Nearly one-third of all electric cars on the roads in Europe are sold in Norway.